Exquisite Sports Treasures would like to present our newly acquired position as a direct distributor offering official NFL items that are coming directly from the NFL straight to us and from us to you!! We will now be carrying Official NFL game used and 1 of a kind collectibles. From game used jersey's, to helmet's, game used ball's and even 1 of a kind items like game used charity cleats from the NFL program"My Cause My Cleats", as well as the coins used in game coin tosses, game used Super Bowl memorabilia, official Draft collectibles straight from NFL draft's as well as items like this game used from a player's game he played!! All items are authenticated by three company's The NFL, PSA/DNA, And us of course E. This is a Official NFL Nike Chicago Bears DB Kyle Fuller Game used set of 1 of a kind custom Cleats from the "My Cause My Cleats" program. 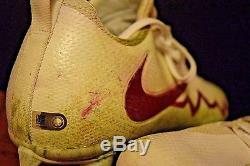 These Cleats were Used by Kyle Fuller in the game on 12/3/2017 agaisnt the San Francisco 49ers. The cleats are 1 of a kind custom cleats, they come from the "week 13 "My Cause My Cleats special week where players pick a charity and design custom cleats that they wear for the game and then get auctioned off after the season, they only do this once a year so these are not just some normal run of the mill cleats. In this home game at Soldier Field against the 49ers The Bears lost a close game by the score of 14-15. Fuller had a great game during this game he had 7 total tackles, 2 passes defensed, and a Interception picking off 49ers QB Jimmy Garoppolo. Fuller had a great 2017 season earning his first trip to a NFL Pro Bowl, climbing the ranks to be considered as one of the top DB's in the NFL. As a show of charity on our own accord we well also be donating 10% of the proceeds from these cleats to the same charity that Fuller chose to support. 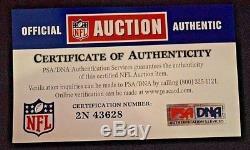 By the NFL, PSA/DNA, and E. The PSA/DNA Authentication is #2N 43628. We are open to suggestions. We will listen to 3rd party options such as holders or escrow etc. The item "Kyle Fuller DB Chicago Bears NFL Game Used Cleats PSA / DNA My Cause My Cleats" is in sale since Wednesday, October 24, 2018. This item is in the category "Sports Mem, Cards & Fan Shop\Game Used Memorabilia\Football-NFL\Jerseys". The seller is "exquisitesportstreasuresllc" and is located in Lancaster, California. This item can be shipped to United States, Canada, United Kingdom, Denmark, Romania, Slovakia, Bulgaria, Czech republic, Finland, Hungary, Latvia, Lithuania, Malta, Estonia, Australia, Greece, Portugal, Cyprus, Slovenia, Japan, China, Sweden, South Korea, Indonesia, South africa, Thailand, Belgium, France, Hong Kong, Ireland, Netherlands, Poland, Spain, Italy, Germany, Austria, Israel, Mexico, New Zealand, Singapore, Switzerland, Norway, Saudi arabia, Ukraine, United arab emirates, Qatar, Kuwait, Bahrain, Croatia, Malaysia, Brazil, Colombia, Panama, Jamaica, Barbados, Bangladesh, Bermuda, Brunei darussalam, Bolivia, Ecuador, Egypt, French guiana, Guernsey, Gibraltar, Guadeloupe, Iceland, Jersey, Jordan, Cambodia, Cayman islands, Liechtenstein, Sri lanka, Luxembourg, Monaco, Macao, Martinique, Maldives, Nicaragua, Oman, Peru, Pakistan, Paraguay, Reunion, Taiwan, Chile, Costa rica, Trinidad and tobago, Guatemala, Honduras, Bahamas, Viet nam.